HMS Campbeltown was a Wickes Class destroyer, built in the US in 1919. In 1940 the obsolete ship was handed over to the Royal Navy - which was in desperate need of convoy escorts as part of a lend-lease program. 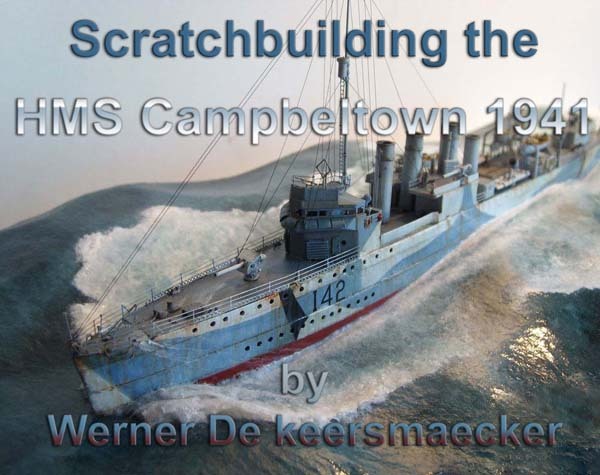 Campbeltown had it's first RN refit in 1941. HMS Campbeltown became famous with operation "Chariot", the St-Nazaire raid, after an extensive refit in 1942. The model, which shows the 1941 refit, is about 90% scratchbuilt. To make my ship, I used drawings from the Anatomy of the Ship (AOTS) book. They were scaled down to 1/350 and printed out. The hull sections were glued to a piece of styrene sheet and cut out. The negatives of these sections were checked to fit against the wooden hull, which was sawn, carved and sanded to shape. The wooden hull served as a master to make a rubber mould. Resin was poured in to make a copy of the hull. The resulting part has a lot of air bubbles that were filled with putty. The plans and sections from the Anatomy of the Ship book, were used to fabricate the other parts as well. I used parts of White Ensign Models photo etch sheet for another 4 stacker (1/350 WEM HMS Burwell), which proved very useful for boat skids. Unfortunately I got lost one part and had to buy yet another sheet. Quite a bit of spare photo etch parts from previous models went into the details, as well as styrene fittings (rod, strips). The aft deckhouse was built with various parts added from the spare box. Styrene strips were glued on to create the hull plating. These are initially overscale so the hull had to be sanded down afterwards. The portholes were then drilled out. To make the boat skids, styrene parts were glued against the finished photo etch section to add the correct thickness and form. The stern with searchlight platform was done using two sets from the 1/350 WEM HMS Burwell PE since it had a slightly different platform construction. The depth charge throwers were made from styrene rod, strips, pre-painted fishing line, and brass rod. The bridge section was built up with styrene and the interior was detailed. Unfortunately I have no pictures of the bridge interior details. The funnels were fabricated from tubing and various brass PE parts. Here the aft deckhouse is dry fitted prior to gluing. The midships section was detailed using the sparse pictures that exist and a tiny bit of guess work. The boats were modified from other kits' spare parts. The boats were carved out and inside detailing was made from scribed styrene sheet and strips cut to the exact length. Some small hatches and engine room hatches have been added. The finished 12 pounder gun is shown here prior to painting. The torpedo tubes were made from styrene rods, strips and some metal and brass rods with spare handwheels added. Here are the 4" ready service racks and Depth Charge throwers ready for installing. Here are the torpedo directors, steering gear, and searchlight built up. Finished torpedo directors ready to install. The finished 24" searchlight is shown here with handles cut out from 1/700 PE ladder stock. The main mast is made from an Aber 1/35 brass antenna and other scratchbuilt parts. The stern depth charge roller racks are from the WEM HMS Burwell photo etch set. I added styrene rod cut to length (for depth charges) and brass rod (for the davits). The finished 4"/50 guns ready to install. The stern gun didn't use a shield. The sea base was, like all my previous dioramas, made from a piece of styrofoam insulation plate. This was cut out using the same wooden hull master to fit in. The next step was gluing watercolor paper on the base and cutting it out along the gap. I used the same method of painting as in my dio "rendezvous north atlantic". Normally I do not paint the base first but as this is a scratchbuilt model an exception was made. Just in case I was not satisfied about the sea base and wanted to remove the model. The last coat was a mixture of acrylic gel, with a tiny bit of white added to create the water on the deck and coming down. Toilet paper (soaked in gloss varnish) in several layers was used to give extra thickness to the foam on the waves. Bow wave was made of toilet paper and tumble dryer fluff. White was added to the light blue and black areas and a bit of black added to the white parts. Thinner was added by drawing vertical lines so the darker base colour appears here and then. Next was "metalising" using a pencil and silver paint, most of it in the bow area. Next was applying a mixture of gloss and satin varnish, corrected with matte varnish here and there. More of Werner De keersmaecker's work.